A few months ago, I re-read the Lord of the Rings trilogy, a feat unto itself considering how weighty a tome it is, and how little time I have. Stolen moments to read are almost non-existent these days. But finish it I did, and I was struck by how each time I read it, a different aspect of the story sticks out to me. This time it was Gollum who struck a chord with me. For those of you unfamiliar with Gollum's story, once upon a time he was Sméagol, a hobbit just like Frodo and Sam. He and a friend happened upon the ring while fishing. Overcome by the power of the ring, Sméagol decided he must have it and killed his friend; taking the ring for himself. Shunned by family and friends, he retreated into a cave under the Misty Mountains and became Gollum. The ring gave him long life, but deformed his body and mind, and was ultimately stolen by Bilbo in "The Hobbit". If I stay with the same metaphor that I used in this post, where diabetes is the ring, then I am afraid of becoming Gollum. 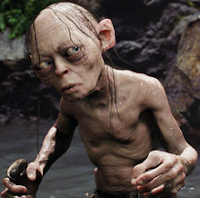 You see, Gollum was torn by his devotion to his "precious" and his great desire to be free of it. His life was consumed by the precious. I have been quiet for the last few weeks. And there have been some good reasons; some of them diabetes-related, some not. But they have caused me to retreat so far into my own cavern that I was afraid that I may not return. I realized I had been missing when, upon seeing me out with the kids yesterday, my next-door neighbour exclaimed how she hadn't seen me in forever. And it's because sometimes the burden of the ring is too much and I have no interest in poking my head out from the safety of my cave. I am consumed by carbs, ratios, lows, highs, correction factors, units, blood sugars and logs. Add to that tummy bugs, teething, fevers of 104.5 and some scary heart episodes for me, then it's a wonder I make it outside at all. The precious is consuming me. My devotion to the precious is evident when someone tries to take it from me. A few nights ago, at a get-together with some other D-Moms, one of them offered her teenage daughter's sitting services. Her T1 daughter. Who was dx'd at the age of 2. And while outwardly I was smiling and saying, "maybe", inwardly my brain was laughing manically. Because I am determined to hold onto the precious with white-knuckled fists. Like Gollum, I am both utterly devoted to it and crying to be free. It's a battle I am fighting in bits and pieces, but one I'm afraid I never will win completely. Alas, in the end it was Gollum's devotion to the ring that ended up destroying him. These days I feel I need to tread lightly lest I follow in his very large flipper-prints. Your LOTR posts are so amazing! I love the analogy in this post. I feel like we are all on the border of "Becoming Gollum." If only we pay a little bit more attention to diabetes, tweak that one more pump setting, we might be able to be "free" of it for the afternoon. You need to link up your "Her Sam" post here, so people can read that one too! I hear you. I am very new to the type 1 world (5 weeks for my 8 year old son.) 2 weeks ago the flu (officially influenza B) started sweeping its way through my house. It hit him the hardest. Just when I was letting out a teeny breath, thinking I can do this, we were faced with ugly BGs and fevers that wouldn't go away. Feeling like a hermit! I love this post..it describes how I feel often! First off, WELCOME BACK! I needed some smiles from you again! Second, yippee for stolen reading time...I've been enjoying some of that myself and forgot how much I enjoy it! Third, TAKE THAT MOM UP ON THE OFFER OF HER T1 TO BABYSIT!!! We have had a T1 watch the girls (just once because of scheduling, but are dying to have her back!) and it was so amazing for Bean to have someone who understands. PLUS, she tested Bean a couple of hours after she went to bed. UM, HELLO?!?! How awesome, especially since that's not one of the things I asked her to do. She just did it because she was testing herself and knew it would be a good idea to test Bean because they had been dancing around like crazy before bed. It almost made me cry, honestly! Hang in there, mama! I have also been a bit hermit like. Nighttime bg's are sky high and no amount of basal changes seem to work. I'm up every 3 hours and feeling zombie-ish, too. However, there is a light at the end of the tunnel. The light is golden and comes in the form of wine at book club! Tomorrow I will be free of it for a few good hours. Seriously consider the sitter. Start small - a short outing. Get a pedicure. Then work your way up to some real craziness like a date with your hubby! Great post. It is hard not to go into drepression mode with diabetes. I think that is why it is best to have a hobby so that diabetes is the side show and you can have your mind on other things. That is what camping does for me. Diabetes in the woods brings it to the most simple state, just you with diabetes and the woods. No tv, internet, phones, or distractions. You can relax and just hike or fish but the diabetes is a simple life outdoors. Thanks for the post. Find your happy place. I, too, have been quiet. And lately I am getting the "hey, stranger!" comments from neighbors. Not sure how to climb out of it, but I'm working on it. Hugs! augh, fantastic metaphor dude! it's always so sad to watch smeagol in the movies, she's so happy and innocent about what the future holds (like us pre-D huh?). Let's hermit together, shall we? I think we would be very good at it and have lots of laughs and fun. Or we could cry and scream and throw pillows at each other . . . that would be fun, too. Just don't hide and stop posting. I could not handle that, K?! Feeling the same here too!